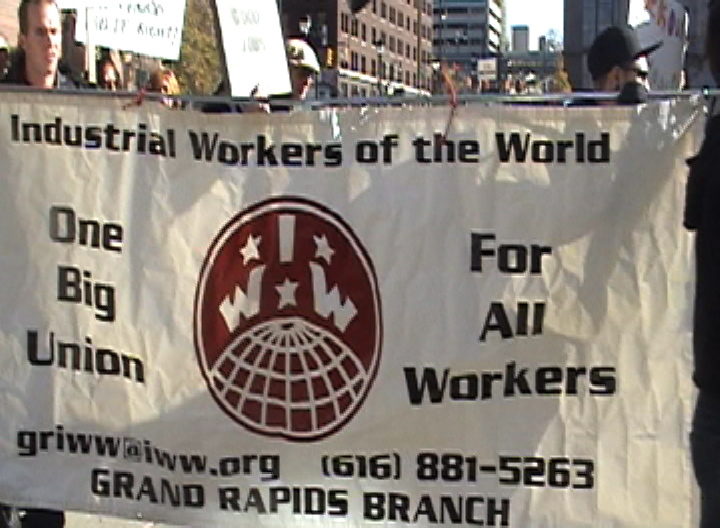 The Grand Rapids branch of the IWW is organizing a protest for this Monday, April 1st in response to the recent firing of one of their members for organizing fellow workers at Star Tickets. IWW Organizer Deirdre Cunningham has been fired from Star Tickets in Grand Rapids where she had been working/organizing for years. The termination comes on the heels of a successful union campaign, which won IWW union certification for all Star Tickets Workers. Deirdre was fired on the day the Union was certified in an attempt to scare the other workers away from their Union. Protest Deirdre Cunningham’s Unlawful termination! If you are unable to attend the protest, the IWW is asking people to call the owner of Star Tickets, Jack Krasula, and demand justice for Deirdre!! Capitalism has got rid of the unions by conniving means, that is in part separating every one as if their is no interconnecting matrix, Blair the ex labor Prime minister is typical of representing labor’s ideals, he is typical of basic right wing ideas but under the banner of labor, the chances are the MI5 or some covert organization has got something on him relating to depravity or some sordid aspect, these people are groomed by Institutes such as The Tavistock Institute of Human Relations, or this type of sinister organization, same as Hoover, head of FBI, could be manipulated to corrupt ideology of a political program that suits the Controlling Elites power structure. What whistle blowers have to take in to account is the police throughout the World will have no qualms in killing anyone that is in their way, you see a policeman and wife in a ritual killing in Melbourne slain before testimony the next day’s court proceedings, the guy who got shot and killed by police at Tottenham, London, causing rioting that ensued, this is what you are up against when cuts in police employment are on the cards. No one knows what individual will be sacrificed or what country may be in line for the next slaughter of the innocent, as one of the Rothschilds stated stay calm, as the Germans stated to the Jews, stay calm when you go in to the bath house, for your edification. Does Krasula have business interests in the Detroit Metro area we can Boycott or picket. Yes, he does a radio show in Detroit http://www.anythingispossible.biz/aboutjack.html.